Our strawberries have been growing at the Cannon Road location in Carlsbad for over 40 years. The field is approximately 80 acres in size and borders the Batiquitos Lagoon to the east and Interstate 5 to the west. Our temperate climate in Carlsbad and the proximity to the Pacific Ocean make for ideal strawberry growing conditions. The cool marine layer allows us to harvest our berries into the summer, sometimes until the end of July. Although strawberries are usually considered seasonal, it's a year-round business for Carlsbad Strawberry Company employing at least 150 people. The harvest takes place between January and July. The strawberry plants stop flowering when the nights are less than 10 hours long, so we begin turning the plants under in July. After the fields are mowed and the plants turned under, we water the fields with sprinklers to help compost the remains of the plants. In August we treat the soil for diseases. This is done to prevent the spread of pests and weeds. In September we make the rows and furrows, apply the fertilizer and drip (irrigation) tape. Depending on the weather at the nursery, possibly 10 to 20 acres may be planted by the end of September. Plastic bed covers are installed in late October. By then, the first flowers will start to appear. If the weather permits we usually see our first strawberries by Christmas. In January, we begin our commercial picking season. Production varies due to cold weather and rain. 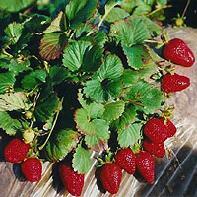 We usually sell most of our strawberries commercially and at our strawberry stands. We open our U-Pick sometime in spring - be sure to watch our website for announcements. Throughout July you'll find the fields full of berries. The strawberries start to get smaller at this time of year but the long days and large amounts of sunshine make them super sweet. Rain affects strawberry production, as does wind, freeze and hail. All these elements also affect the picking conditions. There are many different aspects to growing a successful crop, and weather is just one of them. We use a minimal amount of pesticide and a mild fungicide after times of rain to prevent problems with moisture. We also use an Integrated Pest Management system to reduce the use of chemicals. We monitor every aspect of the farm very carefully, and spray only when absolutely necessary. You may see the man that walks the farm and cracks the bullwhip to keep away the birds that pick the seeds off of the strawberries when he's not around. If you have any other questions about strawberries you'll find the California Strawberry Commission web site full of more information than you ever thought possible on strawberries. Thank you for visiting our web site and Aviara Parkway Farms. We hope you'll make our strawberries part of your table for many years to come!